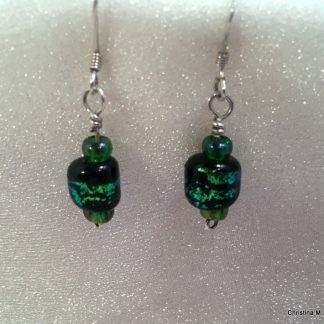 LAMPWORK BEAD MAKING: This class teaches you how to make your own handcrafted lampwork or flamework glass beads. 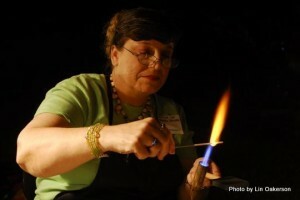 Glass rods are melted under an open torch and formed into glass beads. 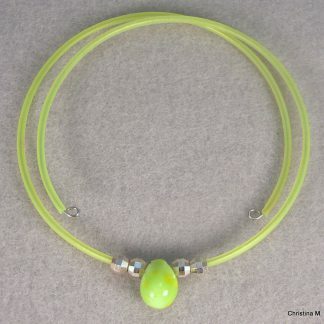 You will learn about expansion of glass, compatible glasses, how to anneal your beads, and much more. 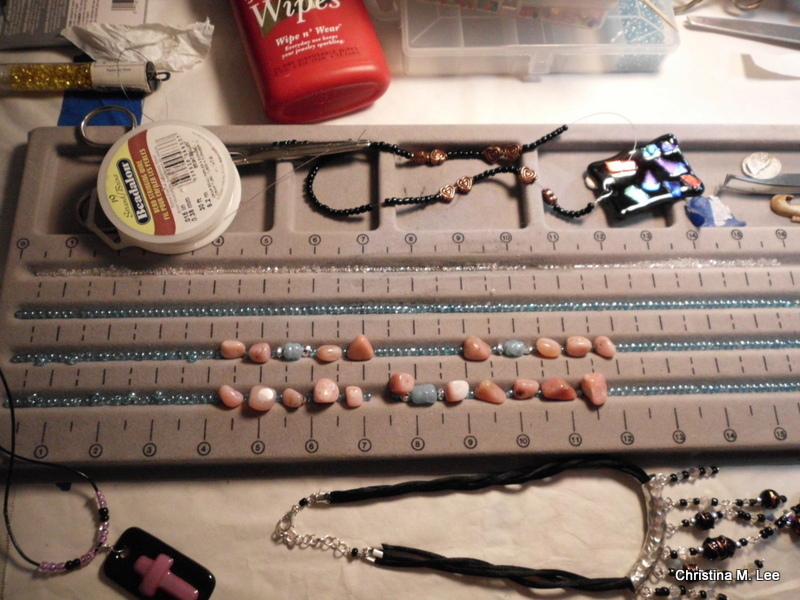 $100.00 includes all supplies and the use of all tools (you take home your finished beads). This is a one secession class, 5 hours long. The class is limited to two students at a time. SILK PAINTING: Paint on 100% silk. In this class you will learn how to prepare and stretch your silk onto a frame for painting, how to find ideas for a design, and how to paint on the silk using non-toxic silk dyes. 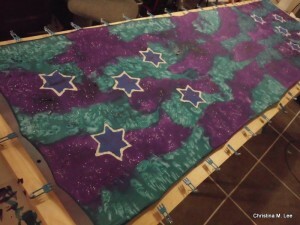 You will learn different methods of creating designs on silk, how to heat set the dyes making them color fast, and about different resists (way to keep the dye from going where you don’t want it to go). $135.00, includes all supplies (silks, paints, brushes and the use of stretcher frames). This is a 3 secession class, each class secession is 5 hours long. The class is limited to two students. You will take home two or three completed silks. 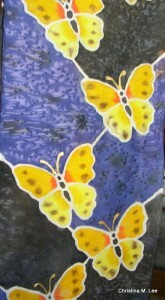 BATIK: In this class you will learn the ancient art of Batik, using fabric dyes, and wax resists. Learn how to create a design on your fabric by drawing or stamping. You will use the tub dying method light to dark and use wax as a resist. Class fees are $200.00 which includes all supplies (fabric, dyes, wax, brushes). This is a 2 secession class, each class secession is 5 hours long. The class is limited to two students. Take home a completed batik. 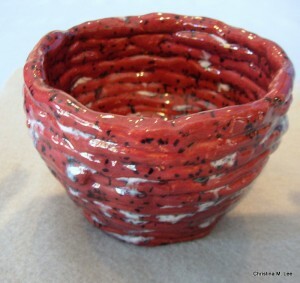 OFF WHEEL POTTERY: (This class is off-wheel meaning all pottery pieces are made without a potter’s wheel.) In this class you will learn how to wedge the clay, to make ball pots, coil pots, pinch pots and slab pots, and how to glaze and fire your finished pieces. This is a very fun class. This class is for children and/or adults, all ages can have fun with the clay. This is a 2 secession class, each class secession is 4 hours long. Class is limited to two students at my teaching location or more students if I come to your location. 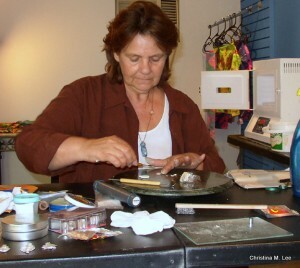 Class Fees: $120.00 per student includes all supplies; (clay, glazes and kiln firing and I supply all tools). A per student discount will be given for larger classes, held at the location of your choice. (If I come to your class setting, and you have 5 or more students.) You will take home several completed pieces of pottery. 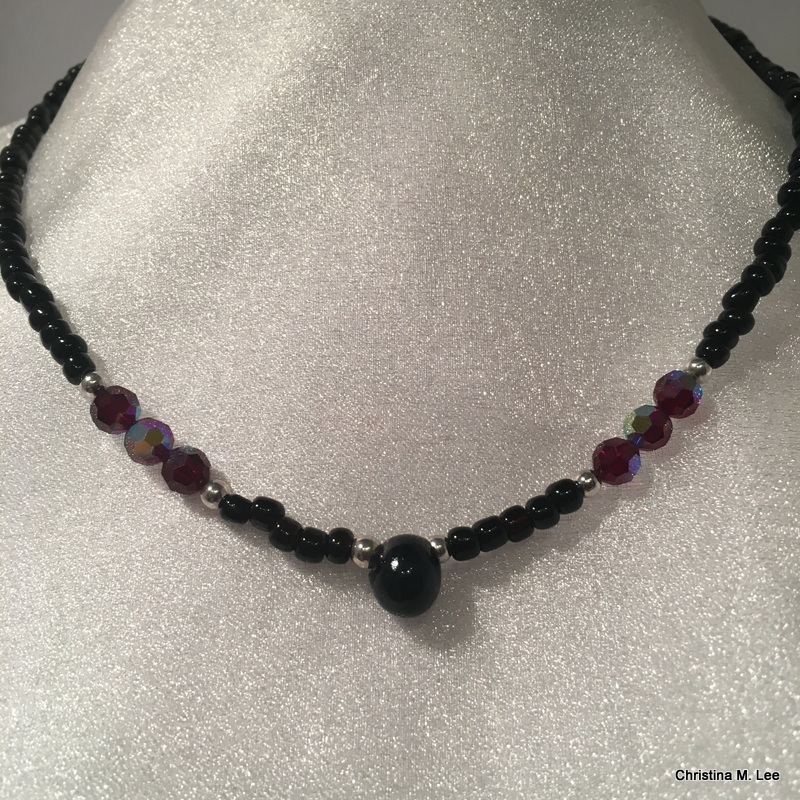 BEAD STRINGING: In this class you will learn the basic bead stringing techniques, including crimping and how to make a basic loop and a wrapped loop. Class fees are $40.00 and includes all supplies. This is a one secession, 3 hour class. Class is limited to 3 students at my location. I can accommodate more students if the class is held at the location of your choice. 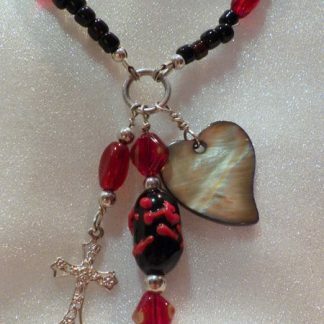 You will take home a completed necklace or bracelet. STAINED GLASS: In this class you will learn the basics of stained glass, including preparing your cartoon (design) and drawing it up to size on paper. You will also learn how to lay out your cartoon on a layout board, and glass cutting, grinding, fitting, assembling, foiling and soldering. Class fees are $190.00, includes all supplies and use of all tools. This is a three secession class, each secession is 4 hours long. Class is limited to 1 student. Take home one small stained glass piece. PRECIOUS METAL CLAY (PMC): This is a basic PMC class. 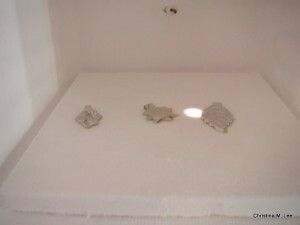 You will learn about the different types of PMC, how to sculpt a design using PMC, and how to fire the PMC in the kiln. PMC is like modeling clay which you can roll, cut, carve, shape, press, stamp, use textures, and get real creative with in designing. You will complete pendants designed by yourself that, after firing, are .999 Silver. (It starts out as clay and after firing in the kiln becomes metal!) Class fees are $165.00 includes all supplies. This is a one secession class, 4 hours long. Class is limited to 2 students. In this class you will use Sterling Silver PMC3 and take home several completed pendants. You will acquire the knowledge of how to fire your PMC at home in your own kiln. More advanced PMC classes are available, please inquire. Jacque getting creative in her PMC class. Clay pieces in the kiln ready to fire. 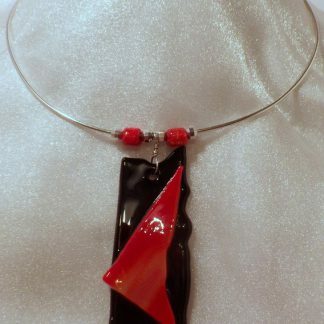 FUSED GLASS PENDANTS: In this class you will learn basic glass fusion. You will also learn about expansion of glass, compatible glasses, how to fire glass pendants in a kiln. You will learn about different types of shelf paper and shelf primer, how to drill a hole in glass and how to finish your pendant for hanging, and much more. Knowledge of glass cutting and grinding is a plus, but not required. Class fees are $100.00 and includes all supplies. This is a two secession class, each secession 4 hours long. Class is limited to 2 students. Student will take home two completed pendants. CROCHET, KNITTING AND/OR LOOM KNITTING: In this class you will learn basic crochet, or knitting or loom knitting in one evening. Private Lessons are one 3 hour lesson $25.00, you come to me. I come to your home for a private lesson $40.00. Supplies NOT included. This is a basic lesson and most people will want to take several follow-up classes to learn more. Contact me for a supply list. Group rate discounts for groups of 5 or more (get you and 4 friends together for a evening of fun and all of you learn together). 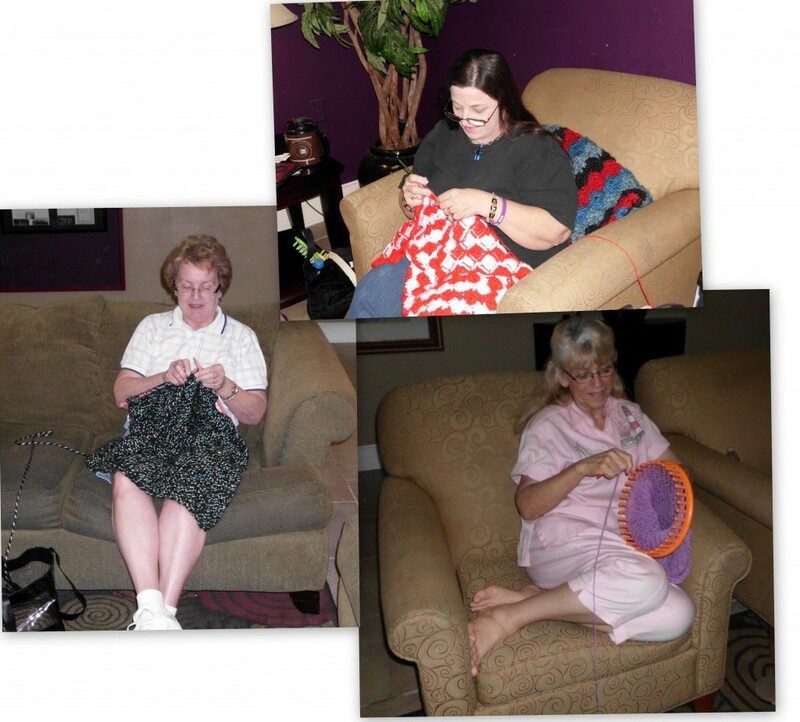 lower left Carol knitting a scarf, lower right hand corner Bobbie loom knitting a scarf. SEWING CLASS: Things you will learn: 1) How to read a pattern. 2) How to measure yourself and buy a pattern that fits you. 3) How to layout the pattern and fabric and cut. 4) What is fabric with a nap. 5) Brands of patterns easiest/hardest to use. 6) How to follow the pattern guide and sew a garment. 7) Basic sewing machine maintenance. 8) How to create Elastic casings, sew a waistband, machine hems, darts, facings, buttonholes and more. 9) How to use your sewing machine, utilize all it’s features. Prerequisites to taking the class: A sewing machine. Commit to meeting once a week for 5 weeks. Be able to transport your sewing machine back and forth to to class for 5 weeks (if you come to me or to a group meeting location). Willing to work on the project the instructor requires you to work on, or in a class setting, work on the same project the whole class is making. A basic knowledge of sewing is very helpful, but not required. Requirements: Purchase all patterns, fabric, thread and notions to complete each project, I will help you with this. A basic sewing kit which will include good scissors adequate for cutting fabric, pins and pin cushion, tracing wheel, seam ripper, seam gauge and a sewing tape measure. Projects we will make in the 5 weeks class: 1) Something with an elastic waist band and hem, (skirt, slacks or shorts). 2) Something with simple collar, facing and buttonholes (shirt or blouse). 3) A lined vest (this will teach you how to line a garment). 4) Stretch knit t-shirt (sewing on stretch knits and how to do sew a rib knit neck band on the t-shirt) (this project is a one session project and you can make a t-shirt for a man, woman or child). You will also learn to cut your own T-Shirt pattern off of a favorite t-shirt that fits you. (Note: The items you make in class can be for yourself, for a child, or for your spouse. Just remember, the smaller the garment, children or babies, the harder to sew, so if you are a basic beginner, you may want to start with something for yourself first.) Fees: Private 5 week lessons: At your location (I come to your home) $150.00, at my location (you come to my home) $100.00. Group lessons: Also 5 weeks, for groups of 5 or more in a class, $60.00 each, either I come to your location where your group meets or each member of the group comes the location of my choice each week. Supplies NOT included. Advanced classes are available for the student who has basic sewing knowledge and wants to learn more. Advanced classes are also 5 weeks and are the same prices as above, they are an independent course of study. In other words, the student will pick the project they want to learn and I will guide them through it, such as zippers, more complicated collars, cuffs, pockets, baby clothes, doll clothes and much more. To sign up for your personal class, contact me via my contact page, Contact, or call at 941-224-6394.